What if the Enterprise was crewed entirely by misanthropic jerks? In Christopher Baldwin's latest webcomic, One Way, humanity sends a highly trained crew on a years-long journey to make contact with a distant alien species. The one problem? They've been selected for this mission because no one can stand them—including their fellow crew mates. After aliens from a faraway system send a message containing their location to Earth, humanity assembles a crew of astronauts and sets them up with a ship capable of carrying them to their destination. But it wasn't just the most qualified astronauts who were selected for this mission—it was also the most expendable. Every member of the crew has pissed someone off, and now they're going to spend years together with no other human contact. Star Trek this is not. 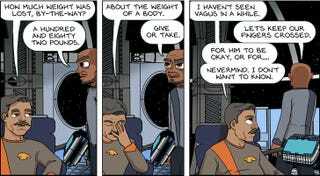 One Way is a gag comic, but with Baldwin, who has also brought us Spacetrawler, Bruno, and Little Dee, the humor is largely character-driven. Francisco, the ship's captain, is stolid in the face of his crew's worst abuses, a quality he'll need as his subordinates insult each other, invade each other's privacy, and wish each other dead, each in their own particular way. When there's little else to do aboard the ship besides sleep with each other and play knockoffs of Bejeweled, they'll take their entertainment in spite. Somehow, though, Baldwin manages to give his characters a strange likability, perhaps because there's a playfulness in their misanthropy and maybe because, for all their flaws, these people are actually good at their jobs. If they do manage to make first contact, however, those aliens might never want to hear from humanity again.